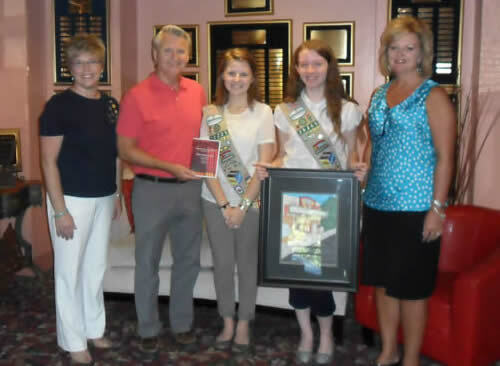 Pictured above are Girl Scouts Georgia McGee and and Regan Plunkett who selected TCT to work on their Silver Award Project. Both helped our interns in the costume room. Georgia is shown with the DVD of the archived	photos they scanned and Regan	is holding a painting she did of the Lyric Building. Regan and	Georgia contributed more than	50 hours each to their project. Picture with the scouts from L-R are Lorilea McGee, their scout leader, Tom Booth TCT Executive Director and Tracie Conwill, TCT President. If you are interested in volunteering at the Lyric call 844-1935.